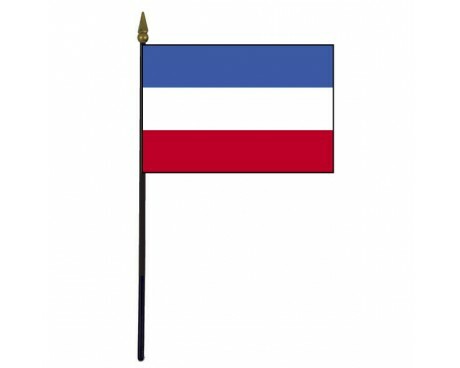 Montenegro Stick Flag - 4x6"
Serbia and Montenegro Stick Flag (Formerly Yugoslavia) - 4x6"
The current Montenegro flag may be one of the youngest flags in Europe, but its lineage stretches all the way back to the medieval period. It has its roots in the traditional heraldry of the region, but the changes that it has experienced over the years have made sure that it represents the modern nation in addition to the area's historical legacy. 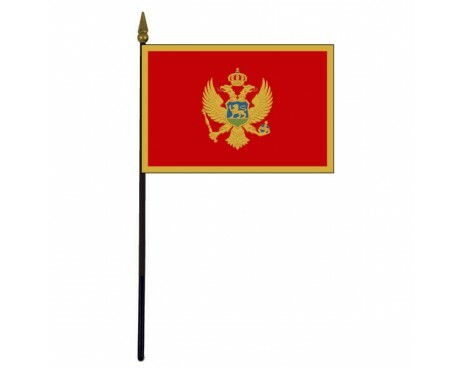 The flag of Montenegro has a solid red field that is surrounded by a dark gold border with the national coat of arms in the center. The coat of arms features a golden eagle with two heads that grasps an orb and scepter in its talons. A crown is placed above the eagle and a shield that depicts a lion is placed over its chest. The eagle is a traditional symbol of the Byzantine Empire, and its use on the Montenegro flag represents Montenegro's historical connection to that empire. The lion is a traditional symbol of religious authority and reflects Montenegro's history as an ecclesiastical principality. The oldest known flag of Montenegro had a solid red field with a white cross in the center. It is derived from the military flag of Serbia during the Battle of Kosovo, which was adopted as a symbol of the Prince-Bishopric of Montenegro in the aftermath of the conflict. It fell out of use in 1852, when the cross was replaced by a white eagle that resembles the emblem of the current flag of Montenegro. The design was replaced due to political changes within Montenegro in 1876, at which point the nation began to use a horizontal tricolor of red, blue, and white. A variant on that flag that included the white eagle came into use in 1905, but the original tricolor flag was also used at the same time. Montenegro unified with several of its neighbors in aftermath of the first world war, so it did not have a flag of its own again until 1941, at which point the tricolor returned to common use. A red star was added to the flag in 1946 in honor of the nation's new socialist government. The star was removed from the flag in 1994, and the modern design came into use a decade later.